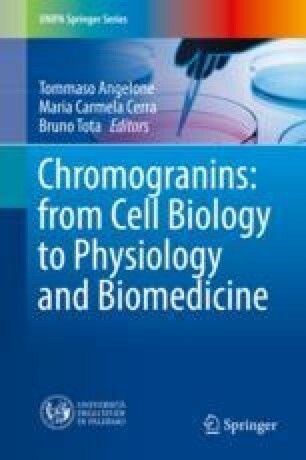 The multifunctional protein Chromogranin A (CGA) is a major marker of the sympatho-adrenal neuroendocrine (SAN) activity. Stored in neuroendocrine chromaffin secretory granules with several prohormones and their proteolytic enzymes, with noradrenaline and adrenaline, it is released with catecholamines upon stimulation. It is also present in other cell types, including myocardiocytes of various vertebrates, and humans, particularly in the presence of cardiomyopathy and heart failure. Due to the processing into a number of biologically active peptides, it represents a prohormone with an important modulatory role on endocrine, cardiovascular, metabolic, and immune systems. Circulating CGA increases in the presence of stress-induced excessive SAN activation and of pathologies such as neuroendocrine tumors, and cardiovascular diseases including hypertension, coronary syndrome, and heart failure. Thus, the protein is considered a promising biomarker for a number of severe diseases. Recently, it was found that in the heart of normotensive and hypertensive rats (SHRs), CGA is processed under hemodynamic and excitatory stimuli, and the exogenous full length protein directly affects myocardial and coronary performance by Akt/NOS/NO/cGMP/PKG pathway. We here illustrate the emerging role elicited by CGA in the control of circulatory homeostasis with particular focus on its cardiovascular action under physiological and physio-pathological conditions. These actions contribute to extend our knowledge on the sympatho-chromaffin control of the cardiovascular system and its integrated “whip-brake” circuits.